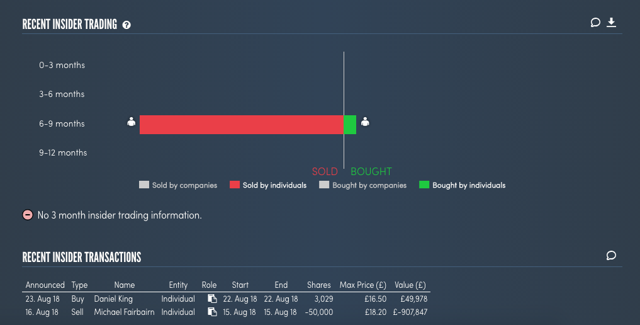 Plus500 experienced multiple major sell-offs recently, while the business ranks one of the top financials per my factor-based stock quality model. The sustainability of the business model remains a major risk facing long-term buy-and-hold investors. The asset-light, cash generative, debt-free and shareholder-friendly natures of the business offer some margins of safety. Founded in 2008 by six alumni of the Technion, Plus500 Ltd. is an international financial firm providing online trading services in contracts for difference, across more than 2,000 securities and multiple asset classes. The company is headquartered in Israel but listed in London, UK under ticker PLUS. US-based investors can get access to the share through ticker OTC:PLSQF on OTC. 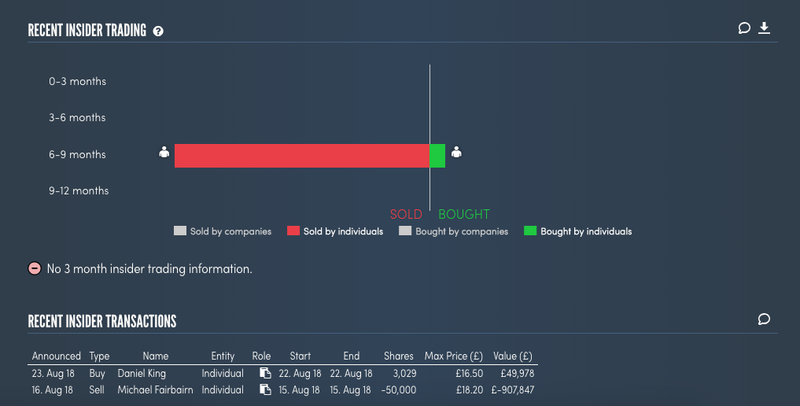 What is interesting about Plus500 to me is that its share experienced multiple major sell-offs recently, which make the name the second-worst performer (as of last Friday's close price) in the FTSE All-Share universe, while it ranks one of the top financials per my factor-based stock quality model. Source: SimplyWallSt; data as of 4/13/2019. An over 30% plunge last Friday (as shown at the far right of the chart above) suppressed the valuation of the stock to a ridiculously cheap level - e.g., both P/E and P/CF below 2x, an earnings yield of over 50%, EV/EBIT of 0.82x. 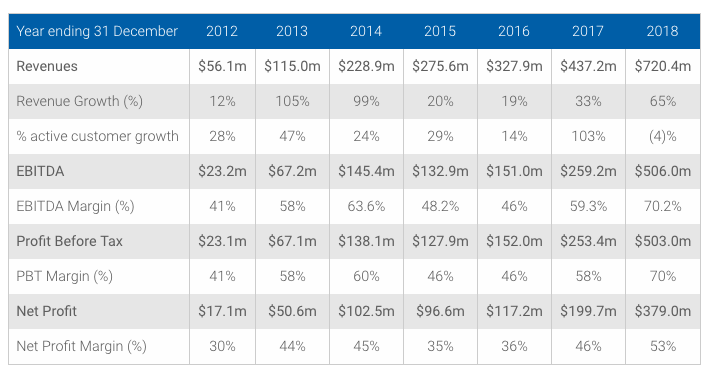 Source: Morningstar; data as of 4/14/2019. The DCF valuation model at SimplyWallSt also implies a 78% discount on the share price. You might think that we are talking about a business facing bankruptcy or something facing a 2008/2009 type of tsunami, but take a look at the financials below at Plus500 - high ROIC, strong cash flow, and healthy balance sheet - nothing that you can complain about in terms of its past records, and when was the last time that you see such metrics with low-single-digit price multiples? The Plus500 story just looks too good to be true. So it this a value or value trap? Let's dig deeper and do a reward/risk analysis of the stock. Unarguably, Plus500 demonstrated a strong growth engine for the past. Over the last 6 years, top lines increased by 13x, and bottom lines by 22x, accompanied by margin expansion. Source: Plus500 Official Website; data as of 4/13/2019. However, the direction of the growth turned sharply since early last year, with both active customers and new customers being trimmed dramatically (see below). The extraordinary results over Q4 2017 and Q1 2018 can be explained by the then prevailing high level of interests in cryptocurrencies, which leads to lower AUAC and higher ARPU. Those periods were also surrounded by high volatilities, which create trading opportunities for market players. 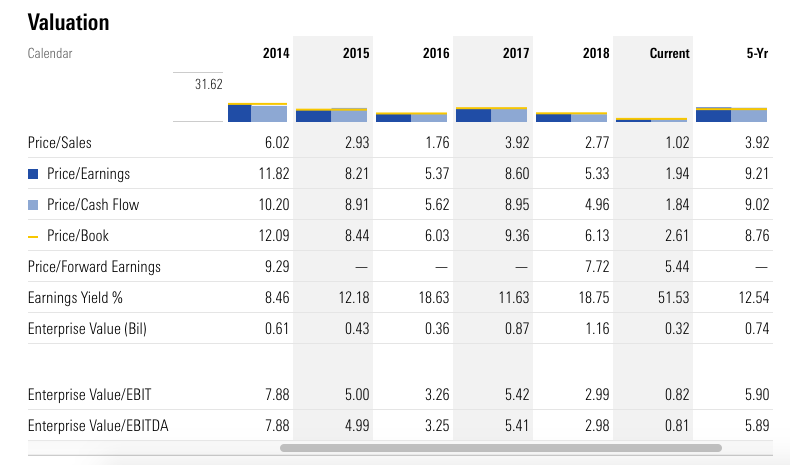 Then it comes to the implementation of ESMA in Q3 2018 along with the lower market volatility, where the revenue dropped even below the 2017 level and the negative value gap (i.e., ARPU - AUAC) emerged (see below). 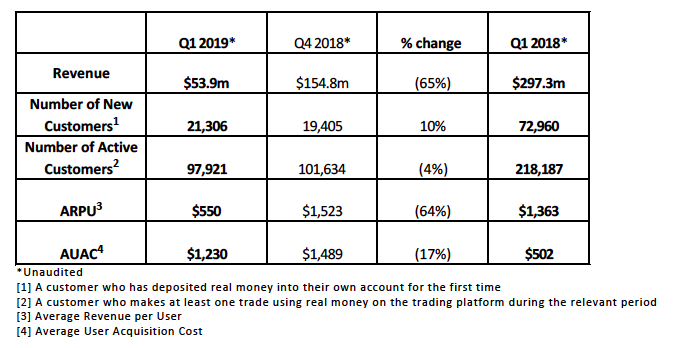 Source: 2018 Q3 Trading Update. The 2017 Accounts state that "In 2017, as in 2016 and 2015, the Company did not generate net revenues or losses from market P&L". The words "or losses" in this statement were included erroneously. 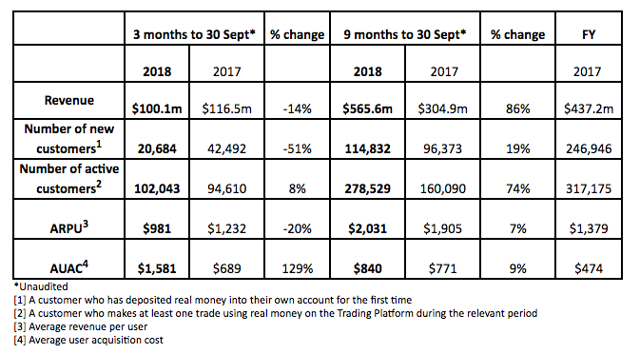 Since the publication of the 2017 Accounts, the Company has disclosed in the preliminary results announcement for the year ended 31 December 2018, issued on 12 February 2019, Plus500 suffered a negative revenue impact of $103 million in the 2017 financial year due to strong client trading performance, particularly in the final quarter of that year. Further, the Company confirms that it incurred a negative revenue impact of $19.5 million for the financial year ended 31 December 2016 (2015: $0.0 million). The stock lost over 60% that week. However, the turmoil was far from over. Fast forward to last Friday, the most recent trading update (see below) indicates a 65% QoQ or 82% YoY decrease in sales, as shares plunged almost a third in one day. 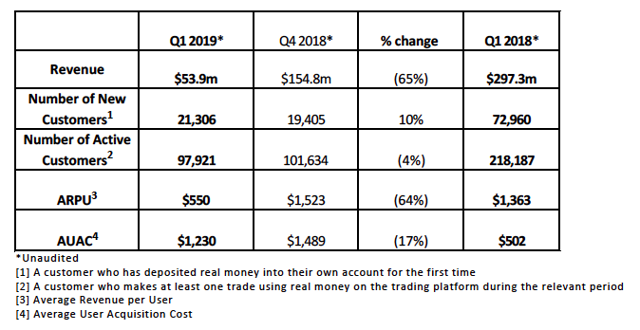 Source: 2019 Q1 Trading Update. The management blamed "extremely subdued financial markets across most asset types," which then caused another negative quarterly value gap. This time, the gap (ARPU of $550 - AUAC of $1230) just widened to a historical level. 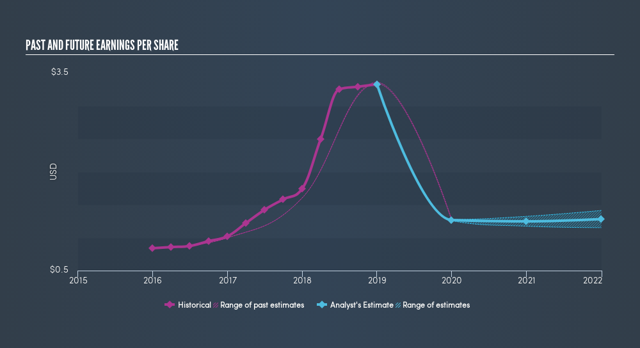 According to SimplyWallSt, the company's earnings are expected to decrease 34.5% annually on average over the next 1-3 years. If we assume stabilization of earnings after the decrease (even with no growth), the P/E would stand at around 5x for the long run, and hence, the earnings yield of 20% or so. It seems that a lot of the short-term negative growth prospect has already been priced into the stock. But the question remains over the long haul, and I think there are the following risk factors facing long-term investors. Regulation: It is inevitable that the business would face more regulatory pressures, while the management has been working to extend the global footprint and to continue to diversify revenues. Also, regulation is always a double-edged sword, which, on the one hand, would increase operating costs and pose threats to revenue growth in general while, on the other hand, would lift the barrier of entry and reduce competitions, providing already-established players with better competitive positions. Volatility: If low volatility persists for too long, the business at Plus500 would be negatively affected. Fortunately, I believe that it is less likely for such a case to often occur in light of the use of algorithms and computers in trading as well as the inherent behavioral bias of human participant in the market. Management: It appears that the management is losing some trust among investors, after the acknowledgment of the drafting error in their previous press release. The management team may want to rebuild their reputation and investor confidence, which could be a long-term process. Moreover, while the TTM insider-trading records give a mixed picture, the recent dramatic increase in CEO's pay implies some warning signals (see below), which shareholders may want to keep their eyes on. Narrowing Moat: With more regulations in place, Plus500 would enjoy the benefit of the higher barrier of entry to the CFD retail trading space. 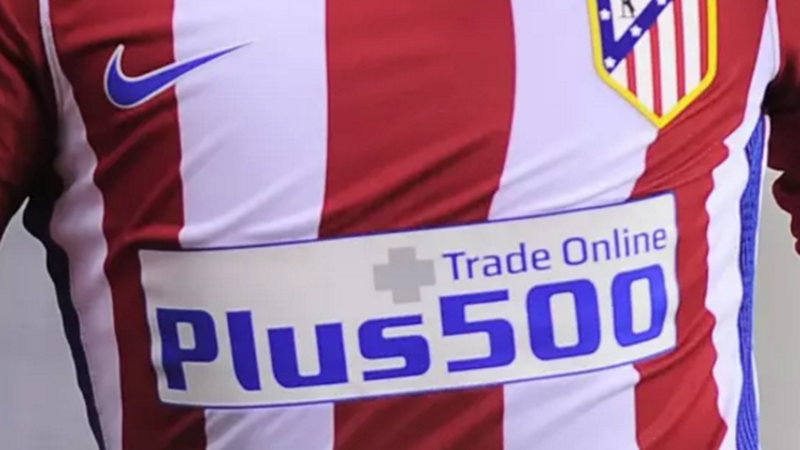 The other main competitive source for Plus500 is its leading position in technology with omnichannel digitizations. I think that both competitive advantages should diminish over the long haul. Some may argue about the network effect. This may be true of a wide moat for a business connecting buyers and sellers (like the exchanges), but may not be so for Plus500 if there turn out to be much more players on the long side than on the short side (very likely the case for "less sophisticated" retail traders): in such a scenario, Plus500 plays the role more of a service provider than of a connector. Sustainability: I believe that the sustainability of the business model is the most significant risk factor facing long-term investors due to the major concern on the larger negative value gap (i.e., ARPU - AUAC) from the recent quarter. Plus500's B2C online platform is mostly driven by marketing promotions to acquire users. A high churn rate (low user stickiness) would tilt CLTV (Customer Lifetime Value) towards ARPU (Average Revenue per User). If earning less value out of a customer than it costs to acquire it, the business model should really be put into question. From a qualitative perspective, it is difficult for anyone to predict the market movement, let alone retail players. Therefore, it is easy to imagine that most users on Plus500 actually lose money in the long term, which would very likely make them leave the platform sooner or later. Based on the most recent trading update, the implied QoQ churn of 25% is not that worrisome as the implied CLTV is around 2x of AUAC, but investors should put this figure on their close watch list. 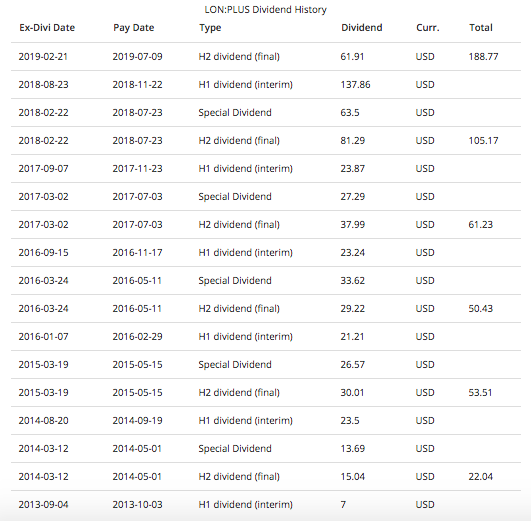 Dividend: Special dividends being excluded, the company has been raising annual dividend payouts consecutively since its IPO, which demonstrates the commitment by the management of returning capitals to shareholder and is also a remarkable track record for any non-US company. While a dividend cut is expected due to the upcoming earnings depression, the company, for the long run, should be able to produce stable income streams based on its cash-generative, asset-light business nature. 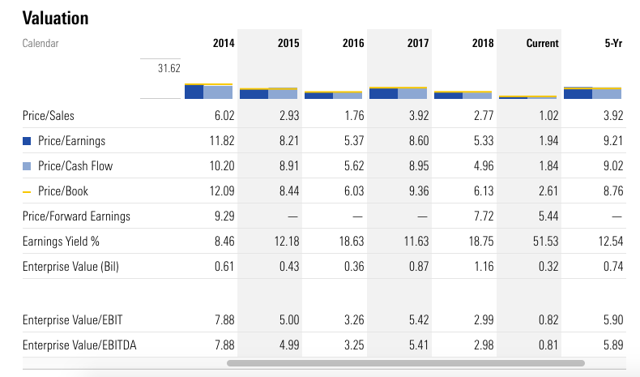 Assuming the dividend policy of a 60% payout persists, we are currently seeing a 12% yield post earnings stabilization at a level mentioned above, which provides a decent margin of safety. Source: Stockopedia; data as of 4/13/2019. Capital-light: Thanks to asset-light, tech-driven online platform model, Plus500 requires very little CapEx to maintain its operations. The annual CapEx/Revenue ratio never exceeded 1% since the IPO of the company, which would make the business flexible. Debt-free: As the saying goes, it is hard for a company to go under if it does not owe any debt. 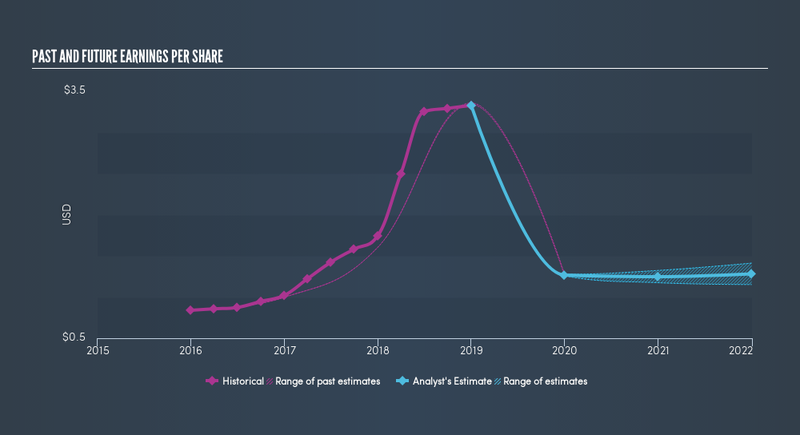 Plus500 does not have any long-term debt on its balance sheet with plenty of short-term liquidity (i.e., a quick ratio of over 6x), which would help the company better weather any business downturn. In conclusion, the sustainability of the business model at Plus500 remains a major risk facing long-term buy-and-hold investors, while the asset-light, cash generative, debt-free and shareholder-friendly natures of the business offer some margins of safety. I would recommend investors to stay cautious on Plus500 with a "Hold" rating on the share. Although short-term fears may have been already priced in, the volatilities of the stock alongside uncertainties around the business should continue for a foreseeable future. Quantitative models cannot work alone (see In A World Full Of Numbers, These Non-Numeric Factors That Matter More). In terms of the churn rate, I have emailed the management team for their estimate and view and am awaiting replies.